Instantly customize your car, truck, van, or SUV with this brand new set of Kitty “Core” design accessories. 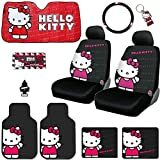 Our Hello Kitty accessories are universal-fit, which fits most vehicles. Our products are easy to clean and they are very durable. Our floor mats, seat covers, and steering wheel cover protect your vehicle’s steering wheel, carpet, and seats from damage. There is absolutely no better way to protect your vehicle. FLOOR MAT FEATURES: Approx. dimensions – 26.5″ inches (long) x 16.5″ inches (wide) – each, Rear mats appox, 14″ X 17″. SEAT COVER FEATURES: Seat covers install with attached elastic cords and included “S” hooks. Made of durable high quality stretch polyester material. Seating surfaces feature urethane foam backing for increased comfort and temperature control. Anti-fading coloring process keeps seat covers looking bright. Machine washable. They do not fit seats with built-in armrest, without removable headrests or side-seat airbags. Do not install these covers on a seat that has an air bag(s) built into the seat itself. INTERIOR ACCESSORIES FEATURES: The steering wheel cover is weather friendly; it protects from hot and cold extremes. Easy installation, no tools required. Universal size fits almost all wheels mostly sized between 14.5 inches – 15.5 inches. All officially licensed products . Our floormats, seat covers, and steering wheel cover protect your vehicle’s steering wheel, carpet, and seats from damage. There is absolutely no better way to protect your vehicle. They do not fit seats with built-in armrest or side-seat airbags. Do not install these covers on a seat that has an air bag(s) built into the seat itself. All officially licensed products This set also comes with a 2 oz travel size of the famous Water free Car Detailing. Purple Slice details your car with just 1 simple step, spray on, wait a few second and wipe it off with micro fiber cloth. You will notice in no time the shin and silky feeling Purple Slice provide Note: The seat cover can only fit regular size bucket seat with removable headrests. It will not not large size seats with integrated seat belts.